I am very protective of my cell phone. I keep it in my pocket or lock it up. It usually just stays in my car. I never let anyone mess with it. If it got stolen I'd call the cops, the FBI, the NSA and Sylvester Stallone's private mercenary army from the documentary he shot about his life a few years ago. No one messes with the cell phone.There are too many numbers of artists I've interviewed. I still talk to a few of them, but it's usually just quick text messages, since they might be on the road touring. Funny Man from Hollywood Undead was one of those people I could hang out with. He was truly a riot to talk to. There is a blend of funny and cool that happens with musicians, where, yes, they have thousands of fans everywhere, but they aren't too cool to express a sense of humor. After the interview Funny Man hooked me up with VIP passes, so a friend and I got to go see them play, and even hang out with the band in the bar. Of course, I was there with 50 other people so it's not like we played beer pong to the wee hours. They were damn good people, though, and their show was off the hook. 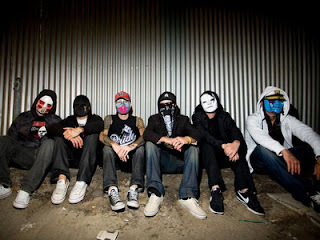 Hollywood Undead is the kind of band that defies classification because they are that original and that good. This confuses critics and entertains fans, so the alchemy is doing something right. With six members in hockey-style masks making music, it’s going to get eclectic. The six young artists delivered solid work with their latest album, American Tragedy, which presented the listener with an audio smorgasbord to feed every rock taste. Building upon the successful formula that infused their first album, Swan Songs, the group has added dance, techno and synth elements to the mixture, giving their Revolt Tour the rocket fuel it takes to sell out seats. Vocalist Funny Man pulled himself away from the fun he was having to chat with CULTURE. I’ve heard you guys described as nü metal, rap, hip-hop, alternative rock and crunkcore. How should your band really be described? There is no genre that sums us up. Our style of music is just what it is. I mean, rap, rock, metal . . . there is no description for what we do. We are Hollywood Undead. Everyone in the band is so different, I mean, there are six of us. 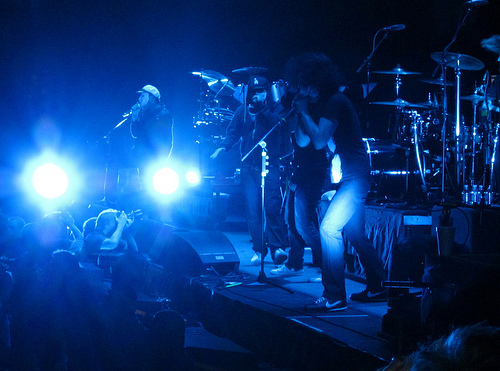 Everyone just puts in their mix of personalities and music, and when you get to our show you get everything we have. You released your first album, Swan Songs, back in 2008. How did it feel working on American Tragedy? What happened was that our band went through a lot of changes, so we are just trying to take things to a whole other level with our new member. We went to the studio and just made it happen. Coming in and doing American Tragedy, I just wanted the world to see something new. We wanted to prove we could keep making great albums. Did you get any complaints over your song “Been to Hell?” The song delivers a harsh portrayal of the entertainment industry. Well, the message is “Just stick to your guns and go for it.” When you go to Hollywood you have to just go for it because there’s no room for anything else. Don’t even bother if you aren’t willing to risk everything. I’ve seen it happen a lot. I have to give credit to my girl. She’s been a songwriter for six years now, and she’s just making a killing, now. She had to really pay her dues, though. It’s a machine out here, and it will grind you down. Well, I think it should be legal, but honestly, I feel it’s never going to be. There’re just so many assholes that don’t want us to get high. I don’t give a damn, though. I grow my own weed and I’m perfectly happy with how things are now. Why is it that there are still some politicians that are still standing in the way of progress? Because they had a boring childhood. What’s funny is that right now I’m in downtown Sacramento, and I’m trying to find a bar, and I keep asking all of these politicians walking around here and they won’t tell me anything. Your taxes pay their salaries, too. What’s up with that? Exactly! I don’t give a damn about politics. It won’t matter if [marijuana] is legal or not; it’s always going to be there, no matter what.